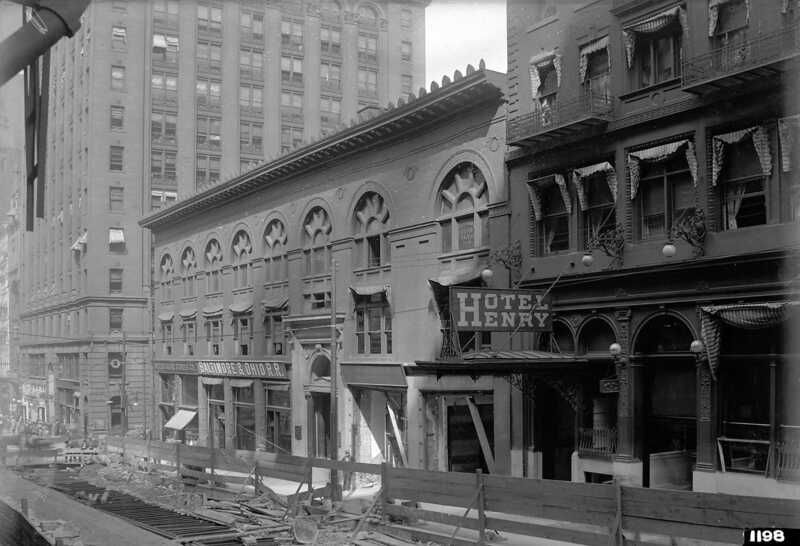 View of the Hotel Henry, the Baltimore and Ohio Railroad offices, and the United Cigar Stores Company on Fifth Avenue as seen from corner of Cherry Way. Streets--Pennsylvania--Pittsburgh--Maintenance and repair. ; Commercial buildings--Pennsylvania--Pittsburgh. ; Blue collar workers--Pennsylvania--Pittsburgh. ; Fifth Avenue (Pittsburgh, Pa.). ; Downtown (Pittsburgh, Pa.).